Apple's 6-pack: the new iPhone and the supersized Plus version. As well as reinventing the very concept of time (possibly), Apple launched a couple of new iPhones yesterday: the iPhone 6 and iPhone 6 Plus. These sport 4.7- and 5.5-inch Retina HD displays respectively, with both models being powered by Apple's A8 64-bit chip. 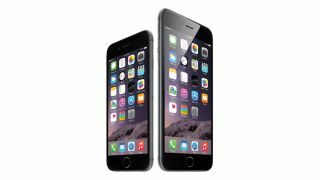 The 1334 x 750 resolution of the standard iPhone 6 is said to offer 38 percent more viewing area than the iPhone 5s (which, alongside the iPhone 5C, has now been reduced in price), while the 1920 x 1080 resolution of the iPhone 6 Plus promises 88 percent more viewing area than the previous flagship. Apple says that the new A8 chip delivers faster performance and better battery life than its predecessor, while the M8 motion coprocessor continuously measures your motion data. Another notable feature is Apple Pay, a new payment system that's designed to let you use your phone to pay for goods and services. With the iPhone 6 Plus being firmly in 'phablet' territory, one thing that musicians may wonder is if this could be the only iOS device they need, effectively serving as both phone and tablet. It's certainly tempting to think that it could do the jobs of two devices, but it is worth considering that, if you buy it outright, even the 16GB model costs £619 (you'll quickly eat up this space if you have lots of apps) while the 64GB and new 128GB models are £699 and £789 respectively. These are serious prices, so the musician's best option may still be a more affordable phone and either an iPad or iPad mini. With their larger displays, these still offer the best options if you're serious about your iOS music making. What's more, it should be remembered that the iPhone 6 Plus won't be able to run music-making apps that are exclusive to iPad (of which there are quite a few) - only those that are Universal or designed for iPhone will run on it. Prices for the standard iPhone 6 are £539 for the 16GB model, £619 for the 64GB model and £699 for the 128GB device. The 16GB and 32GB versions of the iPhone 5s are available for £459 and £499, while the single 8GB iPhone 5c offering will set you back £319. Both of the iPhone 6 models will be available for pre-order from 12 September and ship from 19 September. They'll ship with iOS 8, which will be available to other iOS device owners from 17 September. Find out more on the Apple website.